Wow, Friday night already. 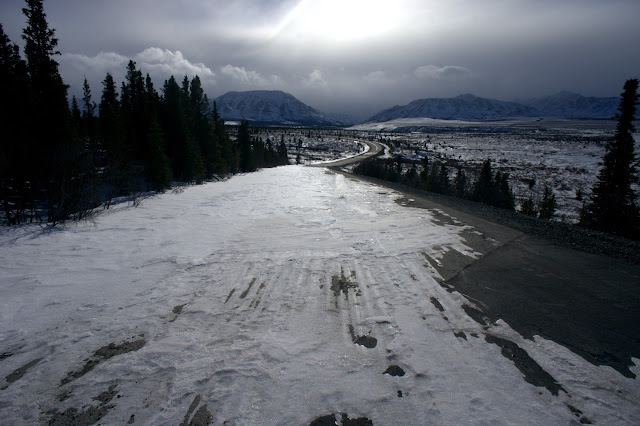 I don't have time for a Denali Highway trip report quite yet, but I dislike getting too far behind with my blogging (call it an irrational aversion.) Anyway, I'm in Fairbanks now, gearing up for the Chena River to Ridge 25-mile race. I was going to come directly here from Palmer, but on Thursday I decided to cut the drive in two and camp one night in Denali National Park. Because I'm going through one of my more extended bouts of insomnia right now, I hoped spending a night alone somewhere dark and quiet, curled up in my fluffy down cocoon, would foster a much needed night of sleep. And of course, I could go for some "easy" tours of the park while I was there. The weather was warm and extremely windy. 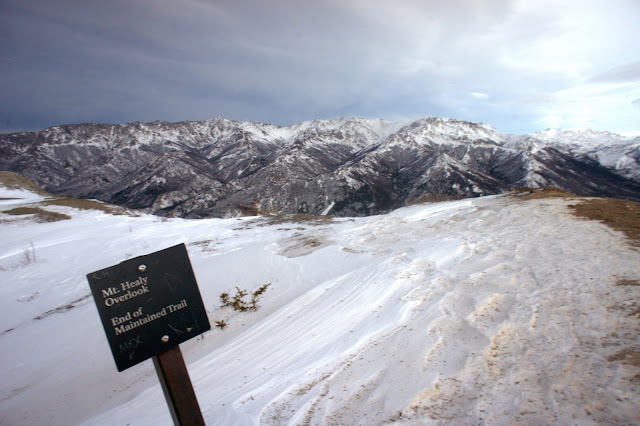 Up here, they call this kind of storm a "Chinook" — temperatures were in the low 40s at the park entrance and the wind was blowing 30 mph with gusts to 50, according to the park ranger. She pointed out a few good trails where I could go for an evening walkabout on my snowshoes. After determining that all of her suggestions amounted to about two miles of meandering through spruce trees, I scanned the map and found the trail that crossed the most topographic contour lines — Mount Healy Overlook. It was insanely windy on Mount Healy. The gusts were manageable in the trees, but above treeline it was a major effort to walk in a straight line rather than stagger about as the wind shoved my body sideways. Because the climb had the wind mostly at my side and back, I didn't quite realize the extent of the wind's force until I turned to face it, and couldn't breathe. Big gusts would hold me like a wall, and even when forward motion was possible, the gusts seemed to whisk all of the oxygen away before I could pull any into my lungs. I just trudged a few steps, then stopped and turned my head around to gasp for air. 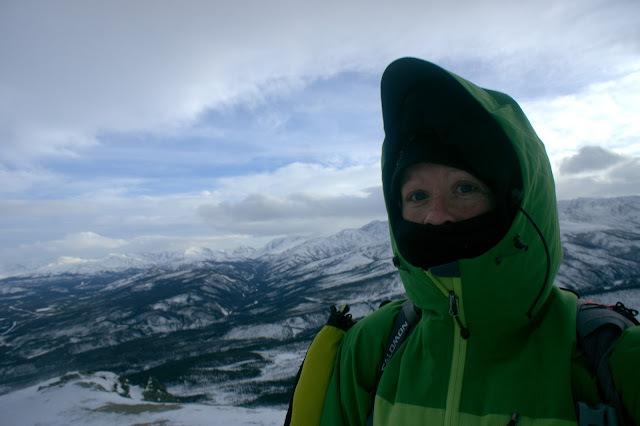 It was all quite exciting, and a little frightening, because it felt like any moment a gust strong enough to knock me off my feet would come and push me toward the steeper side of the mountain. Based on my experiences with Taku Winds in Juneau, I'd say it was gusting to 70 or 80 mph at that elevation. Later, the Denali Park ranger would agree with me. This photo is blurry because I couldn't even hold my camera still in the wind. As I was removing the lens cap, a gust whisked it right out of my hand. It actually fluttered around in the air for several seconds before dropping onto a drift about a hundred feet away, then continued bouncing down the slope, never to be seen again. The Mount Healy hike was only 5.5 miles round trip with 1,900 feet of climbing, but the wind made for an exhausting effort. I was in my cocoon by 9 and actually fell asleep, but Beat called around 9:45 with his own reports of intense wind and wetness, and amid the sympathy and anxiety, I couldn't fall back asleep. I eventually did, after seeming hours of scrutinizing the star-splattered sky for hints of the aurora, and reading my Kindle. It wasn't a fantastic night of sleep, but still one of my better ones. Friday just had to dawn clear, warm, and gorgeous, tempting me out for another day of not resting. 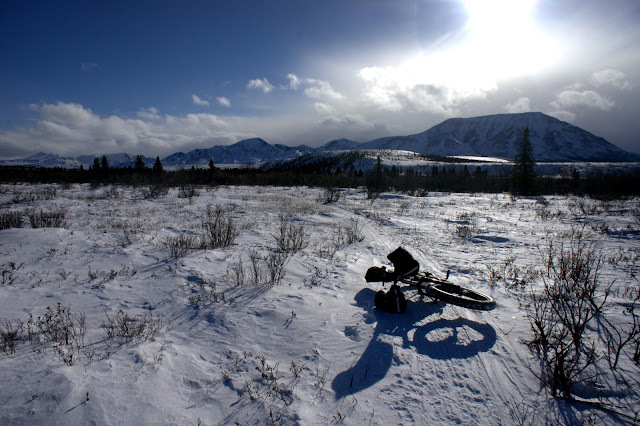 I didn't really want to go hiking in the wind again, but the ranger told me bikes were allowed on the mushing trails along the Denali Park Road. I expected poor trail conditions but figured it couldn't hurt to go out for an hour, maybe 90 minutes. After all, I had a race to taper for. The trails were so much fun. 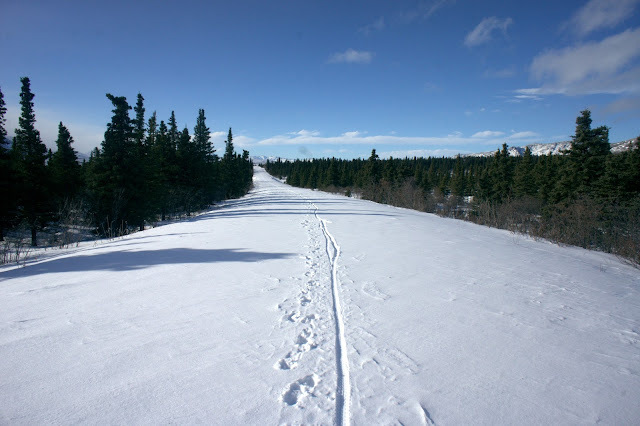 The park doesn't allow motorized use during the winter, so many of the trails were created by dog sled alone. 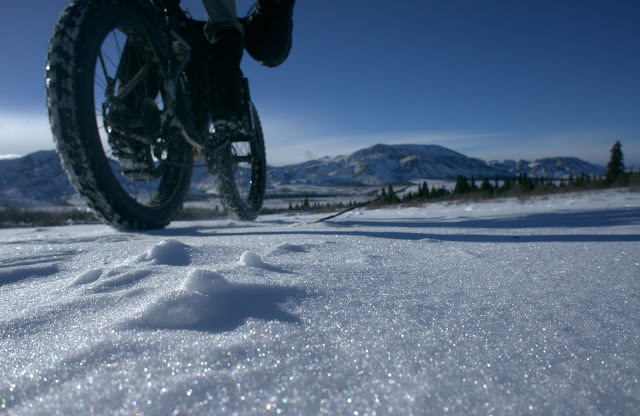 Apparently little dog feet pack a mean trail, because even the heavily wind-drifted sections were largely rideable, and the more protected areas were downright fast. 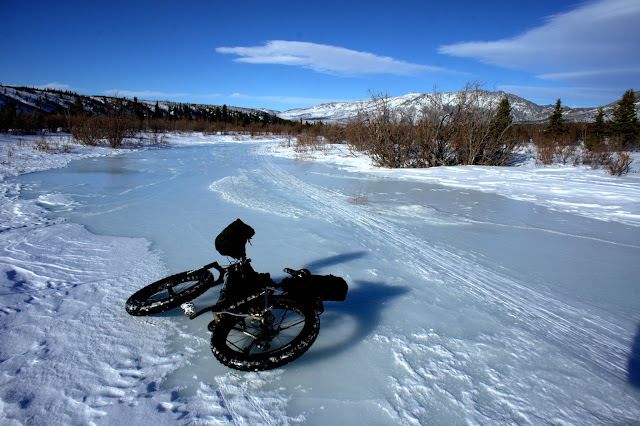 There was an incredibly fun segment that wended through a stream bed, swooping around tighter turns and skating across chunks of frozen overflow. I felt like I was mountain biking in a desert wash — blue ice instead of slickrock, wind-drifted powder instead of sand, huge Alaska mountains instead of redrock cliffs. It was all so grin-inducing, I ended up staying out longer than I intended. 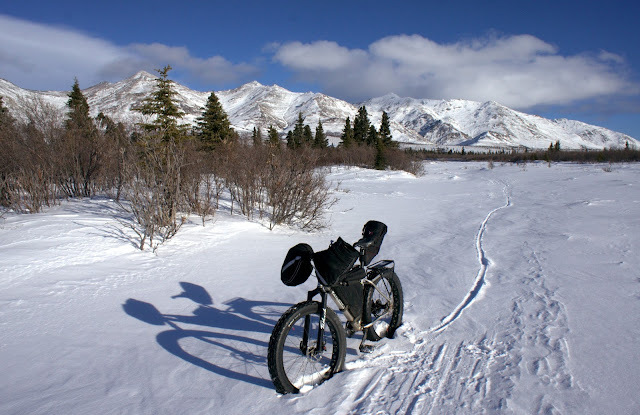 I continued riding the Park Road toward Savage River, to find that some sections were blown completely free of snow — bare pavement. It would have been more fun to ride if I didn't have my tire pressure down at 5 psi, but I bounced along happily with the wind at my back. Of course, where the pavement wasn't blown free, it wasn't rideable at all. 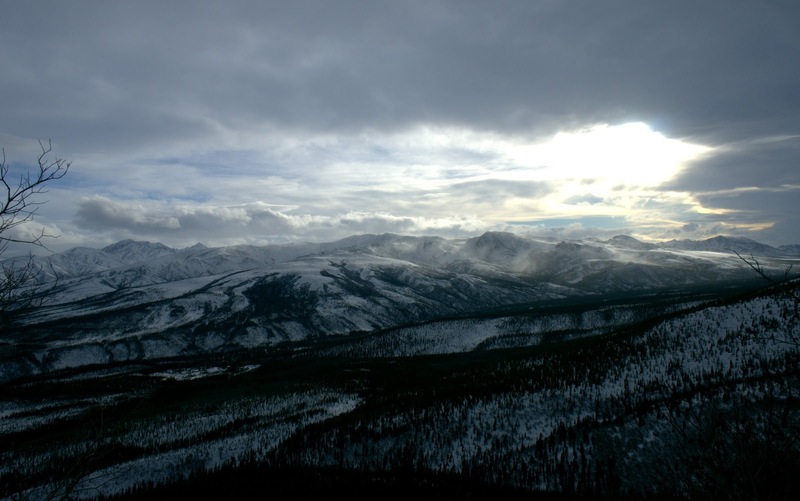 You think that would be enough to coax me to turn around, but I still persisted until enough clouds built up around the peaks to the south to convince me that a blizzard was moving in. That, and knowing I had 13 miles of grinding into the wind to get out of there. At least the return was mostly downhill. Then I got to do this into a 25 mph wind. It wasn't a long walk, but just far enough to remind me that I wasn't mountain biking in Utah or road biking in the mountains. Snow biking just isn't snow biking without the pushing. The ride netted 27 miles and 2,344 feet of climbing in 3:45. Going to Denali National Park was both a fantastic and not-so-great idea, as I'm feeling well-cooked already and I haven't even raced yet. Driving the rest of the distance to Fairbanks this afternoon revealed how overtired I am, with a full release of rapidly swinging emotions. One moment I was listening to Muse and driving too fast, and a few minutes later I'd switched to the soundtrack from "Once" and lapsed into tears as I thought about Beat. But for all of those reasons, it was a great two days. I ran wild with a spectrum of powerful emotions, from fear to anxiety to exhilaration to joy to love and sadness. I let it out and now I feel refreshed. Maybe now I can sleep. I love your spirit of adventure and seizing the moment. Keep on inspiring! 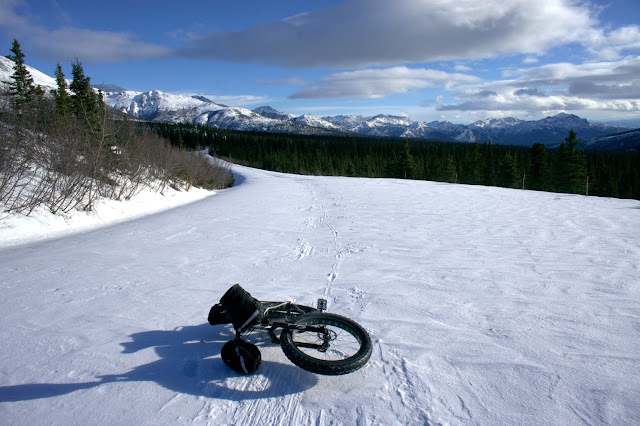 We have oh such very different views of what constitutes snow biking. I'm not sure where this idea that pushing is a part of snow biking came from. This is not correct. 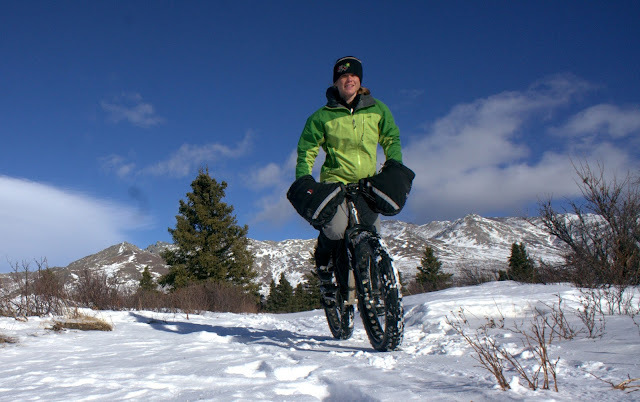 I guess mandatory pushing is an outdated mode of thought from the crowd who pioneered adventure cycling on winter trails. Pushing didn't even have to be a part of this ride if I had just ridden back on the mushing trail I rode out on. 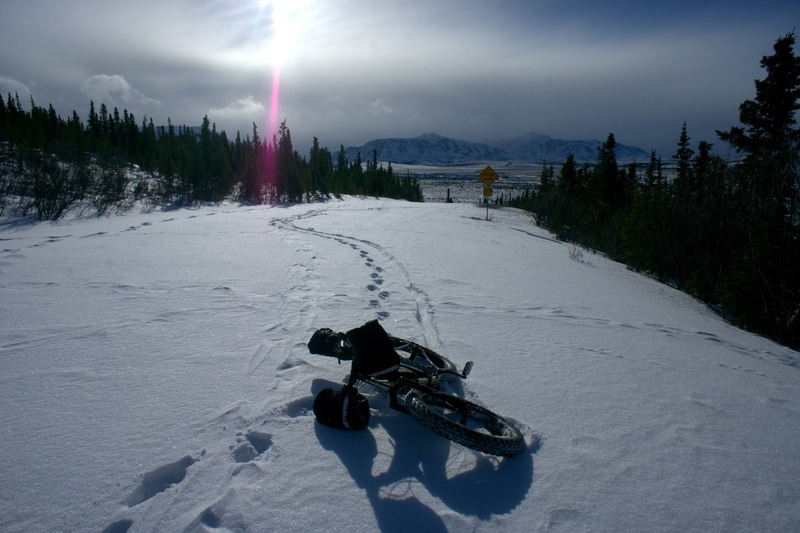 There were a few deeper drifts on that trail, but it was otherwise entirely rideable. I chose to try the road because I prefer exploring new terrain when I can. I completely understand the irrational aversion to leaving the blog un-updated, as a scientist who needs to update all work in a lab notebook! That is my understanding of a 'blog' and not only do I enjoy following blogs that are frequently updated but I also enjoy working with fellow scientists who keep their work well documented and up to date! In that last picture of your on your bike, it looks like you have on VERY LARGE mittens. It's cracking me up.